Lettuce is one of the most popular types of leafy vegetables. It’s delicious, crunchy and light leaves are an incredible source of essential nutrients that are beneficial to human health. Everybody likes it, but certainly it is an essential part of the meals like sandwich or when it is served with lunch. Its leaves are rich with liquid that resembles milk. That is why it got its Latin name Lactuca sativa. It is known that these vegetables are great for weight loss, mainly because they contain a lot of protein and very low number of calories. Below we tell you more about the lettuce, how to cultivate it, how useful it is for you and how you can use it. If you are interested in cultivating lettuce it is easy and simple. Best time of its cultivation in the open air is during the spring and autumn, because during this period the temperature is not high. Its seed thrives in conditions of 15 to 20 degrees, and begin to sprout already in four days. After a month and a half this vegetable reaches maximum growth, and during this time the air temperature should not exceed 20 ° C.
It needs soil rich in humus, which will hold moisture well and keep plant roots. During cultivation, it is necessary an average of 15 litres of water per square meter twice a week at the time when it is not an arid period. It is desirable that the land is loose and rich in organic matter. The optimum pH value of the soil should be between 6.0 and 7.0, and be sure to pay attention to the fact that the earth has a high concentration of salt. For growing lettuce it is essential that during the autumn you add manure or mature compost in order for root to receive much-needed minerals and materials for the growth and development of plants. In the spring it can be used as a fertilizer. Planting can be done at the end of October. Harvest is done on several occasions, or when heads and leaves reach their shape, colour, size and strength. Then lettuce is healthiest and you can assess it by touching the plant and evaluate if it is mature. The harvested head can be kept for 2 to 3 weeks at a temperature of about 2 degrees, and at a relative humidity of 95 percent. The leaves of the vegetables contain many phytonutrients that have a positive impact on people's health, protecting us from many diseases. When it comes to lettuce vitamins are present in a high percentage and there are indeed plentiful. It is an excellent source of vitamin A and beta carotene. Also striking is the fact that in 100 grams of this there is 247 percent of the daily requirement for these compounds! One should not forget that it contains a high percentage of folate. It is rich in vitamins C and K, which help prevent cell aging. It is interesting that the consumption of lettuce is advised for people affected by the Alzheimer's disease because it inhibits the neuronal damage in the brain. It is rich in dietary fibre, which creates a feeling of satiety, and thus it is a food that is easily digestible. For those who care about their weight, lettuce contains small number of calories. On average there is only 15 kcal in 100 grams of this delicious and refreshing green leaves. Its colour tells us most about its composition, because it contains the minerals of which the most common is iron, and calcium, magnesium and potassium. They are an important component of our cells, tissues and organs. Besides them, manganese and copper are present, which are useful for the production of red blood cells. This vegetable is very popular across the globe and certainly you will like it. Many nations have been cultivating it and have used it primarily for medicinal properties. Here are some benefits of having a green salad for your health. Because it contains a high percentage of fibres that affect the improvement of digestion, this is the food that is most commonly used for weight loss. These things may sound strange, but know that the quality and long-term weight management is very important to have proper digestion. If your choice is lettuce, diet will be easier, more bearable, and most importantly - you will not have the feeling of hunger. Vitamin C and beta carotene are friends when it comes to health of your heart, and in lettuce there is an abundance of them. Together they will help in the prevention and removal of excess cholesterol in the blood, which keeps you from many diseases. 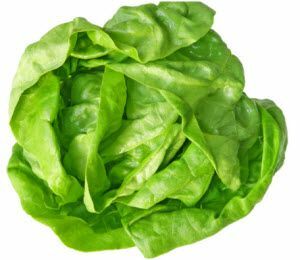 It is interesting that lettuce for heart health is kept because it is a vegetable that prevents the deposition of calcium in the walls of veins and arteries. You do not have to buy expensive tuna in cans just because you have heard that they are rich in these beneficial acids! They can be found in lettuce. If you did not know, we will tell you that in addition to omega-3, it also contains omega-6 fatty acids. We recommend frequent consumption of these delicious foods. Thanks to it you will secure your body what it needs and spend very little money! Lettuce keeps the human health even when it comes to the malignant diseases. Specifically, in its leaves there are compounds that affect cancer cells and prevent the growth and enlargement of the same. It is particularly interesting as these vegetables are the right choice for patients with leukaemia, because there is evidence that increased consumption can remove up to 50 percent of cancer cells! As we said before, lettuce contains calories in fairly small amounts, while on the other side is rich in protein. 20 percent of them are located in these tasty leaves. Of course, the more you eat, this will bring a greater amount of an amino acids which is particularly beneficial for your muscles and bones. We mentioned how white liquid is leaking from the vessels which resembles milk. It is amazing how this wonderful ingredient has a very positive effect on solving problems with insomnia. The secret is that it has a relaxing effect similar to opium, but without any side effects. If you want a good night's sleep, just eat a dinner portion of green salad or make a juice out of it! The minerals in the vegetables help in phasing out the toxins from your body. Therefore, encourage the maintenance of alkaline balance in the body. It will give you more energy, you will feel strong and good, the better you will think and reason, and your skin will become beautiful and clean. The low glycaemic index, is the result of the fact that it contains few calories. This food is great for anyone who pays attention to blood sugar levels, which is the most the common choice in diabetics. Regular consumption of lettuce prevents and reduces the risk of many diseases. It is most commonly recommended to those who develop anaemia, as well as the possibility of the occurrence of osteoporosis, cardiovascular disease and Alzheimer's. If your unsolvable problem is dry and chapped skin, there is no need to buy expensive creams and preparations. Nature took care and the lettuce is the best solution! It is enough to cut few of its leaves and boil them in water for one minute. After that, remove them and wrap in a clean gauze. Put it on your face, neck or any other part of the body that is affected by this issue. After half an hour, remove the liner and flush the treated area with tepid tea of ​​chamomile. Repeat daily until symptoms withdraw. Problems with burned skin after sun can be very painful and uncomfortable and you need to respond as soon as possible. Boil the lettuce leaves over low heat for an hour and a half. After that, strain the water in a glass bottle and allow it to cool. Use it for washing or flushing of the skin that is affected by burns. Thus prepared lotion is useful against blemishes, and can be used up to three days, after which you just create a new one. As we said, this vegetable very successfully helps when it comes to problems with insomnia. If you suffer from it, take 50 grams of fresh leaves of this plant and mix them with the same amount of lemon balm leaves and dill. Pour them with 250 ml of boiling water, cover and let it sit for about 20 minutes. Then strain and drink only at bedtime. Wash the lettuce and leave it to dry. Grate one fresh carrot in large pieces. Clean the cucumber and cut it into slices. In a pan pour oil and when it warms add the two chicken fillets cut into cubes. When the meat is roasted, remove from the heat and prepare dressing for a green salad. You will make it the best if in the blender you insert yogurt, sour cream, chopped garlic clove and rosemary, thoroughly mix. Of course, if desired, you can add some spices, and the best are Mediterranean spices. Arrange lettuce leaves on a thin and put them over the chicken, spinach, carrot, cucumber and dressing. Remove crust from bread and soft part cut into cubes. Lettuce leaves, wash and dry, but in the meantime, cook two eggs and leave until they cool down. In a pan heat the three tablespoons of olive oil, then add finely chopped garlic, then diced bread and salt goods. Fry until the dough from all sides golden and crispy. Arrange lettuce leaves on a plate as a basis for the following ingredients. Eggs cut into slices or rings. Then add a little Parmesan over it and fried bread cubes. Mustard, vinegar, mayonnaise, lemon juice and two tablespoons of olive oil, stir and serve them as a dressing for a green salad. If desired, you can add salt and pepper. Lettuce costs about half a cent per head and can be found in almost all markets. Of course, you can buy these vegetables in large supermarkets, but we recommend that you do it in the stalls. It is especially important to note that it is best to buy lettuce that is organically grown. Only in this case you will be sure that it does not contain toxins and pesticides that are extremely harmful to the human body. After all, you can always plant them yourself in your garden - it is easy to plant it, and is very useful for you! It should be noted that lettuce causes side effects only in those people who are allergic to this type of food. More specifically, what is usually considered problematic are proteins. Although it is a very small percentage of the population, those who suffer from allergies to amino acids should be on special alert and avoid the consumption of vegetables. Lettuce during pregnancy is very useful, because of the abundance of vitamins and minerals. It is an essential contribution to meals in this period of the year, and eat it as often as possible with the main courses. You can also consume it independently, with a little salt and olive oil, when it is healthier.